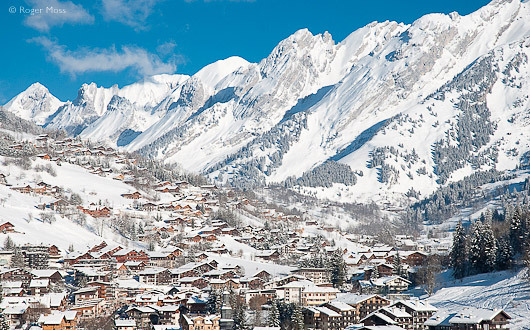 A short drive from the lakeside town of Annecy, the unspoilt mountains and valleys of the Massif des Aravis offer relaxed family skiing and solid value. 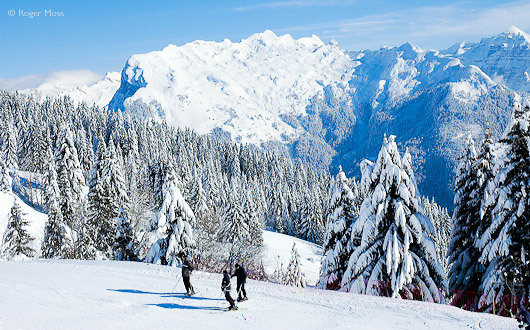 Along with neighbouring La Clusaz it’s deservedly popular with day visitors from nearby Geneva, while quick flight transfers and easy road access attract increasing numbers of skiers from the UK. Although in absolute terms altitudes are modest, the location has continued to produce abundant snowfalls in recent years. Relaxed skiing amid genuinely unspoilt Alpine scenery. Short transfer time from Geneva airport. Despite the name, the most extensive and most varied terrain actually lies on the slopes above Le Chinaillon, directly accessible from the village via the 6-seater high-speed La Floria ski-lift, or a selection of alternative chairlifts strung along the valley. Those based in Le Grand Bornand village have a choice of two gondolas, the longer of which (Le Rosay) reaches beyond the gentler, lower terrain and drops skiers at the foot of onward lifts serving the steeper stuff. The high-point is Mont Lachat (2100m), which has a dedicated freeride area. Further on, at the far end of the Vallée du Maroly there’s a real sense of remoteness (plus a large snowpark) below the Col des Annes and at the Tête des Annes (1869m). From here you start to appreciate that the terrain is actually much more extensive than it looks on paper. Closer to home, there are reassuringly gentle novice areas just above Le Chinaillon and at the top of the La Joyère gondola, for those based in Le Grand Bornand village. New for the winter season 2017/18 is the replacement of the Rosay lift's historic 'eggs' by comfortable cabins, customised with graphics by young artists. There's also a new piste called Gypaète at the summit of Mont Lachat, offering an alternative route to the famous Dénivel'Maxx and its 1100m drop to Le Grand Bornand Village. 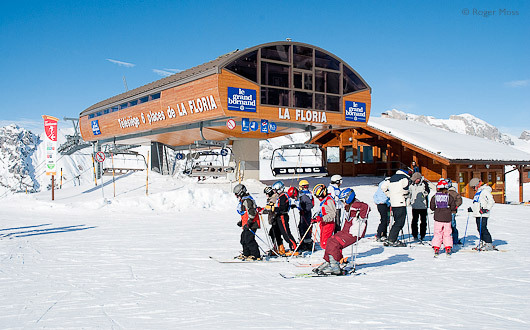 Plus, there's a new link on the slopes of Chinaillon for an easier and quick return to the front-de-neige at Floria. The original village has authentic Alpine charm. 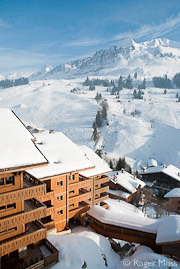 Large-scale apartment developments at Le Chinaillon enable easy access to the slopes. Skiers here have not one but two villages from which to select their base: Le Grand Bornand and its slightly higher neighbour in the next valley, Le Chinaillon. Perhaps surprisingly, each has a genuinely traditional feel, although Le Grand Bornand village has a greater sense of being in the heart of things. Both are year-round working communities, so feel alive and welcoming throughout the seasons. The architectural style leans towards individual traditional chalets, and looks set to remain so, if sympathetically-styled large-scale apartment developments like the Village de Lessy are anything to go by. Connecting the two villages are frequent shuttle bus services used by skiers and residents alike. 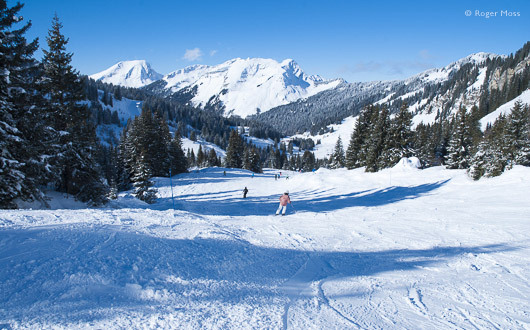 Why go skiing in Le Grand Bornand ? It would be hard to imagine a more relaxed and traditional setting in which to ski, and the ease of accessibilty is another plus factor for skiers from the UK. Generations of French and Swiss families, too, continue to return to enjoy the place in which they learned to ski, and you can see why. The terrain accommodates just about everyone, from first-timers up to freeriders and freestyle skiers, while the Famille Plus label underlines a continuing commitment to family skiers. If there’s a limitation then it has to be in the mile-hungry intermediate sector - but add nearby La Clusaz (included on the Aravis lift-pass) and everyone should be happy. Highly ranked park with half-pipe, boarder cross and 4 jump lines. Top class area with big choice of loops and trails. There are also 2 biathlon stadiums but don't be put off, learners are welcomed in fun learning areas and easy village trails. Access to all lifts except Joyère cable car, Les Languières chairlift, Chatillon and Stadium draglifts. 50% discount for the disabled person and their companion (conditions apply). ESi Starski have different offers and discovery packages for disabled, seniors, or just for fun. English spoken, range of equipment. Adapted lessons for wide range of disabilities with the ESF Handiski Club Loisirs. Range of equipment and accessible meeting points or pick-ups. English spoken. Toilets are available by the cash desks at Chatelet and Gettiers, as well as sectors Maroly and Rosay. 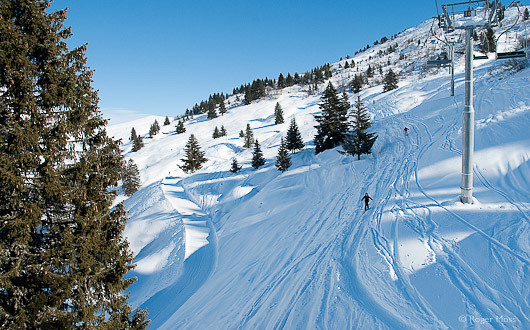 Cross-Country skiing accessible with reserved parking in the Village and Les Plans in the Bouchet valley. Easy tracks in Les Plans. Range of adapted accommodation available. Terrain for almost everyone, including more timid improvers. Moving upmarket, but still has accommodation for most budgets. Solid value, without compromising the quality of the ski experience. One of the shortest journeys for those driving from the UK. Intermediates will soon hunger for more mileage, satisfied by shuttle transfers to and from La Clusaz. If you don't have a full Aravis lift-pass, a Carte d’Hôte card (from your accommodation supplier) will allow you to travel free on shuttle buses. Located in the centre of Le Chinaillon and close to the slopes – literally across the road from a lift serving the slopes, ski schools and lift-pass desks. Each apartment is furnished and equipped to a very high standard of comfort and convenience. Living areas have a double pull-out bed (making up 2 single beds), plus a fully equipped kitchenette. There is also a bathroom and WC (separate in some larger apartments). All apartments have satellite TV, direct telephone line, free Wi-Fi and a balcony. This prestige residence has a spacious lounge area with open fireplace, Wii games in a snug family area, laundry room (payable), ski lockers and a luggage room. There is loan of cots and high chairs (subject to availability - please request at time of booking), irons and ironing boards, board games plus fondue and raclette sets. The Residence has its own covered parking (payable €105/week, max height 1.80m), which is strongly recommended in view of the very limited amount of outdoor parking available nearby. Guests will find the complex lift system confusing at first (we had to take 6 lifts from our upper-level apartment to reach the ski lockers), but the high-speed direct lifts are very efficient, the only delays occurring, predictably, during Saturday changeovers. The village shuttle service to the slopes and the village centre stops outside the Reception area. There is also a half-hourly bus service down to Le Grand Bornand village stopping near the Tourist Office. Ask at Reception for your free Carte d’Hôte travel card. 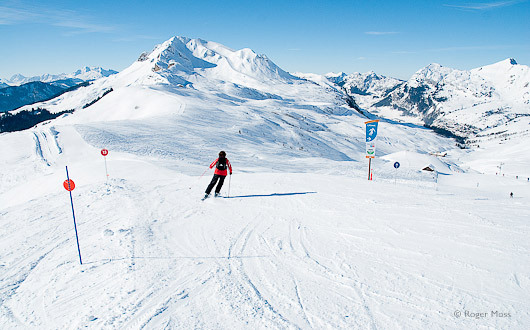 As a Famille Plus resort, Le Grand Bornand offers activities for all ages and abilities. Sporty types can try Fat-biking on snow or get an adrenaline rush from spped-riding. There's an 800m2 ice-rink in the village as well as an aquatic centre. On the lower slopes near the La Floria chairlift, this ancient farm building houses a warm and welcoming bar restaurant. An open fire, cosy seating and plenty of warming, traditional dishes are on offer both during the day and in the evening, when guests climb to the chalet via steel steps. We enjoyed the raclette with a plentiful salad in place of the traditional charcuterie (ideal for vegetarians) followed by génepi and myrtille flavoured sorbets. Situated at the foot of the Village de Lessy near the tourist office, this restaurant is great for informal dinners and serves a good range of traditional dishes. Vegetarians should find something on the menu to suit - try La Boite Chaude (local cheese baked in its box) served with potatoes and salad. We enjoyed the Escalope Savoyard - generous portions of chicken served with croziflette. Expect to pay €15-18 for a main course. Situated on the plateau at the foot of the Terres Rouges and the Tolar chairlifts in the Maroly sector, this restaurant has a lovely sunny terrace with bar and dining area inside. It’s a self-serve restaurant with quality, freshly-prepared dishes. We enjoyed the plat-du-jour of roast chicken with potato gratin and salad for €11,50. We returned later for a warming vin chaud in the bar for €3,50. Follow the A41 to Annecy (north) then the D909 to Thônes, Saint-Jean-de-Sixt then Le Grand Bornand. Alternatively, follow the A40 to Bonneville via Geneva, where you take the exit signed Aravis Resorts. The nearest airport is Geneva (50km), where you can transfer by bus on Friday, Saturday and Sunday. To reserve your journey see www.gare-routiere.com, expect to pay around €56 return. Travel by Eurostar to Paris then fast TGV from Paris-Annecy (3½ hrs). There are good bus connections (ski season) to the Aravis resorts from the bus station. For details and to book your journey see www.voyages-crolard.com. Expect to pay around €8,40 return. As we roll into Le Chinaillon at nightfall the heart of the village is covered by a thick blanket of fresh snow and we reflect on how long it’s been since we were last in Le Grand Bornand in winter. It’s already good to be back and the timing is perfect, with further falls forecast overnight. Sure enough, next morning we awake to find snow-ploughs hard at work keeping things moving, and piste-groomers, heading back after what was clearly a long night. As the last snowflakes swirl and sting in the breeze we walk down to the La Floria chair-lift and are soon heading up to a distinctly chilly 1800m. When we get there the sun is hanging in a crystal clear sky, encouraging us to set our sights on the furthest point we can see: the 1869m Tête des Annes. The descent on the Blue-graded Col des Annes qualifies as a classic scenic cruise, taking us past traditional alpage farmsteads and a tiny, remote stone chapel. Moments like this sum up the spirit of skiing in the Massif des Aravis. Some easy off-piste in the fresh snow. The Vallée de Maroly provides a beautiful scenic cruise. Things warm up rapidly on the first run of the day, the long, Red-graded Combe de la Tolar dropping away steeply towards the base of the next lift: Les Terres Rouges. This time it’s a slower haul, giving us time to get our bearings and watch the first of the day’s freestylers making exploratory runs over the freshly-dusted humps in the snow-park. At the top we set off past the aptly-named Panorama mountain restaurant on the Blue-graded Les Rhodos to join the Almet drag-lift for the long, near-silent haul towards the Col des Annes. It’s a pretty basic lift, but drops us neatly at the start of Le Fenil, a bracing Red run which feeds into the lower reaches of Blue-graded cruise down from the Tête des Annes. Getting there is an entertaining affair, courtesy of the Les Annes chairlift, whose relaxed progress takes us through pine forest and into the wide open spaces falling away on either side of a ridge leading to the 1869m summit. By now the villages seem a very long way away, and the ski area has taken on a new, much larger dimension than we remembered from first time around, when we hadn’t made it quite this far. The view from the top makes it all worthwhile, as a vast snowy landscape floats high above the dense mists cloaking now-distant valley floors; today, as usual, the skiers are getting the better deal. The six-seater high-speed Floria lift offers quick access to the heart of the ski area. Le Grand Bornand's big intermediate terrain under one of the resorts lifts. After a welcome lunch break back at the Chalet du Maroly we take the La Tolar chairlift over to our starting-point. From here we pick up the Red-graded Les Lanches piste, working our way towards the novice area at the summits of the gondolas from Le Grand Bornand village. When we get there the only run which would normally take us down – the Red-graded l’Envers piste – is closed, so we ignore the alternative of a gondola ride and instead spend some more time getting better acquainted with the areas below Mont Lachat and the Roc des Arces. L’Abondance (whose lower reaches are equipped with floodlighting) is a popular Blue piste which drops neatly down to the foot of the Les Gettiers chairlift, with the option of peeling off where it merges with the Red-graded Les Gentianes for the final run down to the La Floria six-seater. Take it and you can pick up the full length of Les Gentianes or, if you have energy to burn, test your stamina on the moguls of the steep and generally-ungroomed Les Dames Red down to the Maroly sector. Alternatively, running alongside is the Black-graded Couloir de la Sonnerie, after which you might welcome Le Lac, a gentle Green-graded return run through the trees. 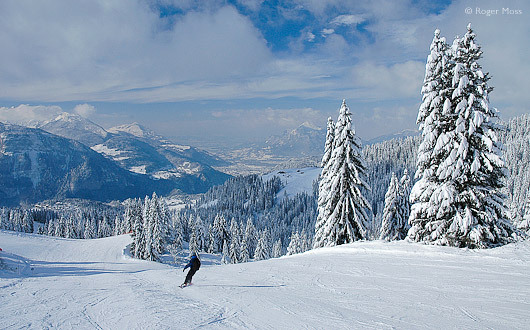 The resorts of La Clusaz, Le Grand Bornand, Manigod and St Jean-de-Sixt are collectively known as the Lake Annecy ski resorts. 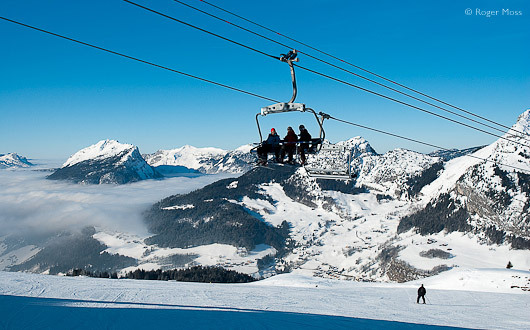 The resorts are situated in the Aravis mountains which fringe the edge of Lake Annecy and are known for their charm, authenticity, plus ease of access especially from the international airport at Geneva. The following morning finds yet more fresh snow, so before we ski we make the most of the chocolate-box setting by walking over to Vieux Chinaillon, the very oldest part of the village. It’s time well-spent, looking and feeling like the quintessential Alpine community you always pictured but never thought you’d find. But this is the real thing, and like skiing around the local mountains and valleys, it’s a revelation for anyone more accustomed to modern, purpose-built ski areas. 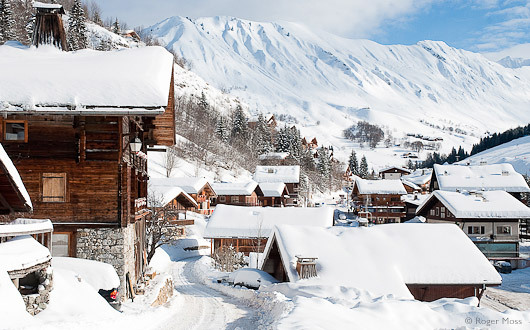 Vieux Chinaillon - the old village - looking spectacular under fresh snow.